With expectations of a record large U.S. corn crop in 2014, market attention will soon shift to prospects for corn consumption. 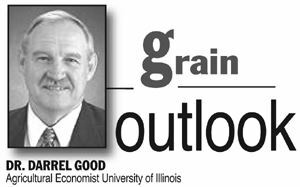 The market will follow a number of indicators of potential use as well as the revealed pace of consumption in the ethanol, export, and feed markets. Ethanol use of corn has increased during the 2013-14 marketing year following a sharp decline during the 2012-13 marketing year. The increase has been fueled by a combination of increased domestic consumption of ethanol, increasing exports and declining ethanol imports, and some rebuilding of ethanol stocks. Based on U.S. Energy Information Administration monthly estimates of ethanol production from September 2013 through May 2014 and weekly estimates for June and July 2014, it appears that domestic ethanol production will reach about 14.1 billion gallons during the 2013-14 corn marketing year that ends on August 31. That compares to about 12.8 billion gallons during the 2012-13 corn marketing year and 13.8 billion gallons during the 2011-12 corn marketing year. Ethanol production of 14.1 billion gallons points to corn consumption of about 5.1 billion bushels during the current marketing year. Ethanol production during the upcoming marketing year will likely be supported by a continuation of a positive trade balance and a further increase in domestic consumption, but will not likely benefit from any further build-up of stocks. A positive trade balance should be supported by relatively low ethanol prices and relatively high gasoline prices as well as favorably priced U.S. ethanol relative to Brazilian ethanol. Domestic consumption should benefit from a modest increase in domestic motor fuel consumption. The EPA’s final rulemaking for the Renewable Fuels Standards (RFS) is not expected to have much impact on domestic ethanol consumption during the year ahead. The primary impact from the expected reversal of the preliminary write down of the renewable mandate for 2014 would be to incentivize a small increase in consumption of E15 and E85. Domestic ethanol production during the year ahead should be maintained at or slightly above the level of the current marketing year, pointing to corn consumption of 5.15 to 5.2 billion bushels. U.S. corn exports during the current marketing have exceeded early season projections, with the latest USDA projection at 1.9 billion bushels. Census Bureau estimates of exports are available for the first 10 months of the 2013-14 marketing year. Exports during that period exceeded USDA export inspection estimates by 49 million bushels. Assuming that margin persisted through early August, exports during the final 3.43 weeks of the marketing year need to average 35.9 million bushels per week to reach 1.9 billion bushels. Inspections averaged 37.4 million bushels per week for the four weeks ended August 7. In the July WASDE report, the USDA forecast 2014-15 marketing year corn exports at 1.7 billion bushels. The expected year-over-year decline reflects a projected decline in world corn trade and a loss of market share to Argentina. As of July 31, the USDA reported that 305 million bushels of corn had been sold for export during the upcoming marketing year, about 60 million bushels less than sales of a year earlier. Sales to Japan and Mexico exceed those of a year ago, but sales to China are down sharply. Corn exports are difficult to anticipate as they will be influenced by the size of crops in a number of areas (some of which are not yet even planted) and the volatile world political environment. Some production issues in China, the much lower price of corn, and the competitive price of corn relative to other grains are all positive for U.S. export prospects. Feed and residual use of corn is also difficult to anticipate, largely due to the apparent variation in the “residual” component of use. Residual use is thought to be positively correlated with crop size so a large crop this year would point to another year of large residual use. Feed use of corn is obviously influenced by livestock and livestock product production and the unknown variation in feeding rates per animal. The USDA has projected a one percent increase in the number of grain consuming animal units during the 2014-15 marketing year. In addition, corn feeding rates should be supported by lower feed prices, low corn prices relative to other feed ingredients, and positive profit margins for all the livestock sectors. Weekly, monthly, and quarterly USDA livestock and grain stocks reports will be followed closely to judge potential feed use of corn. Some small expansion in dairy cattle numbers is occurring, but broiler placements are running near the level of a year ago. A decline in the reported cases of PED virus along with the continuation of heavier slaughter weights may support corn feeding in the pork sector. The number of cattle being fed, however, will remain below the level of the previous year for an extended time. A modest increase in feed and residual use should be expected during the year ahead.